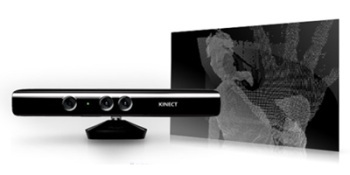 Kinect for Windows will cost $100 more than the 360 version when it comes out on February 1. Microsoft revealed at the Consumer Electronics Show last night that the Kinect, the motion control system originally designed for the Xbox 360, will officially come to the PC on Feburary 1. It also revealed that the Windows version of the device will cost $249, $100 more than the regular price of the original 360 model that came out well over a year ago [and a lot more than that if you're poking around on Amazon]. You may be wondering why Microsoft is giving such a hefty bump to the price of a device that's already been kicking around for so long, especially since a number of individuals already have the 360 Kinect working on PCs. But Microsoft insists that it's still a solid deal at that price point, because the technology it uses cost "tens of thousands of dollars just a few years ago." Besides, somebody has to pay for this stuff. "The ability to sell Kinect for Xbox 360 at its current price point is in large part subsidized by consumers buying a number of Kinect games, subscribing to Xbox Live and making other transactions associated with the Xbox 360 ecosystem," Kinect for Windows General Manager Craig Eisler wrote on his blog. "In addition, the Kinect for Xbox 360 was built for and tested with the Xbox 360 console only, which is why it is not licensed for general commercial use, supported or under warranty when used on any other platform." Kinect for Windows, however, will be a "hardware-only business model," meaning that Microsoft will give away the SDK and runtime software to anyone who wants it. The company is also investing in "scenarios beyond the living room," as the Windows version will be far less game-centric than its console cousin. "Kinect for Windows will also support gesture and voice on Windows Embedded-based devices and will enhance how data is captured and accessed within intelligent systems across manufacturing, retail and many more industries," Eisler wrote. "We are building the Kinect for Windows platform in a way that will allow other companies to integrate Kinect into their offerings and we have invested in an approach that allows them to develop in ways that are dependable and scalable." I'm not entirely sure what that means, but I do know that the $250 price means that I won't be rushing out to grab one of these things on launch day. Not that I really see much of interest in the concept anyway, at least not at the consumer level; motion controls could serve well in commercial applications like self-serve kiosks or advertising displays, but the relatively cramped confines of the average PC setup don't strike me as an ideal place for flapping your arms around like an idiot. Haven't people been able to modify the 360 version to work for PC? Or am I imagining that I saw that? Yep, you're right. And I still don't see this selling much at all. Well, what'd you expect? It's Microsoft. They want money. It'll be down to the same price as the Xbox version within months. No-one really wants one for PC quite yet, I think, so they'll put up the cost a bit. Yeah until the market self corrects what you would see is the purchase of the 360 version with the kinect in favor of this even for business applications. However, its a realistic possibility we may see this technology become insanely pervasive and live in a world where microsoft is always watching our every move. Didn't someone take one apart a while ago and find out that they were making a ridiculous profit margin on it back then? Either way, the only reason I'd get in front of one of those things is to see if it would pick up the gesture of me folding up in pain from laughing at how they think this will sell reasonably. Makes sense, they can't cut in costs by selling you expensive games that they get licensing money from. Of course 250 is quite some money to shell out for something not everyone can or will use, but it's a lot harder to sell it for less than it's worth because of no license costs. Also, this version has better support for stuff closer to the kinect, so you won't have to sit 15 meters away. I think you meant this article http://xbox360.ign.com/articles/113/1133932p1.html and this was back in 2010. My guess is that they want to test out how much people are willing to pay - another example for such pricing is the iPhone, which has a ridiculous profit margin. And how exactly will they convince those who bought the Xbox Kinect to not connect their Xbox versions to the PC? How will they convince those of us to buy the PC version and not use the version we already have? Unless the PC version is actually superior in some way, I'm not buying. Microsoft shouldn't have said "This technology cost us loads of money to develop". The market does not and will never care how much money you've sunk into your product. All that the market will ever care is if they think the price you've set is what they'll pay. At $250, its not worth it for me. This will work because they know that PC hardware enthusiasts will be willing to shell out the money. They know this will work because any R&D establishments/groups that use the technology to accomplish great feats will pay the money to keep things legit and get support. They know this will work because it is likely that the SDK will be somehow linked to, and only operate with the windows model of the device until someone cracks it. It doesn't interest me at all, but you guys need to understand that the majority of people who buy this for PC won't be using it for gaming at all. Haha, how about all the money made on selling PC OS's subsidizes the PC Kinect? What a bunch of money hungry animals. Microsoft really does hate PC development. They are putting out an official one as a money grab since people have shown interest in it for PC development. Anyone who buys one of these things is really stupid. No offense, but none of your reasoning makes much sense since it's an item marketed to the PC gaming crowd as well marketed to the R&D establishments. It also means that anyone who uses it to create a game or interactive demo for people to mess around with will understand that people will need to own one to make a product worth while. No one will develop anything for it on the PC if people cannot afford to purchase one. Also, your assertion that it won't be used for gaming doesn't make much sense. Up until now, most people that own one are using it for gaming, whether it's for the 360 or has been modified as a computer controller. It's kind of like "taking apart" an Xbox 360 game and finding out it's just a $0.01 plastic disc: it's not the cost of the components that matters, it's the cost of the intellectual property. "Since we're going to put less features on this product, the only logical thing to do is increase the price point."